Hello from Ogre Jenni! I work at the Jean Cocteau Cinema in Santa Fe! Do visit us if you ever get the chance. On February 23rd the Cocteau teamed up with Sundance TV to show the first episode of their new series, Hap & Leonard. The show premieres tonight at 10/9 Central! Don't miss it! The cast is spot-on: Michael Kenneth Williams (The Wire) as Leonard, James Purefoy (Rome) as Hap, and Christina Hendricks (Mad Men) as Trudy, not to mention all the other players in this wildly twisting and turning narrative. 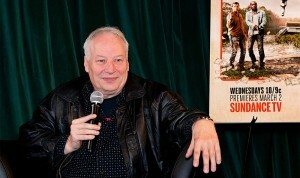 The same evening we had the pleasure of hosting a live Q&A with Joe Lansdale, author of the Hap & Leonard stories. (If you missed the event, here are some pictures from the Sundance TV team). 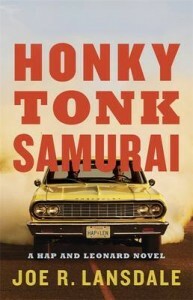 Joe was kind enough to sign copies of his latest titles from the Hap & Leonard series: Hap and Leonard and Honky Tonk Samurai. If you aren't familiar with his work, Joe writes some of the best character dialogue out there, complete with great Texan accents, perfect pacing, and killer humor. They are now available, along with some other Joe Lansdale titles, at our online bookstore. Vietnam veteran Leonard Pine is even more complicated: black, conservative, gay...and an occasional arsonist. With Leonard on the job, small-time crooks all on the way on up to the Dixie Mafia had best be extremely nervous. 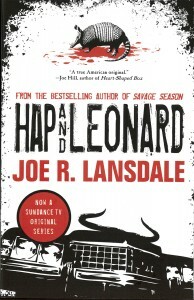 Joe R. Lansdale’s popular Texan crime-fighting duo are immortalized in this complete collection of Hap and Leonard short stories and tall tales. Additionally, you'll find one brand-new story and an original introduction by New York Times bestselling author Michael Koryta (So Cold the River). We are still working on this, trying to get the shipping costs down.